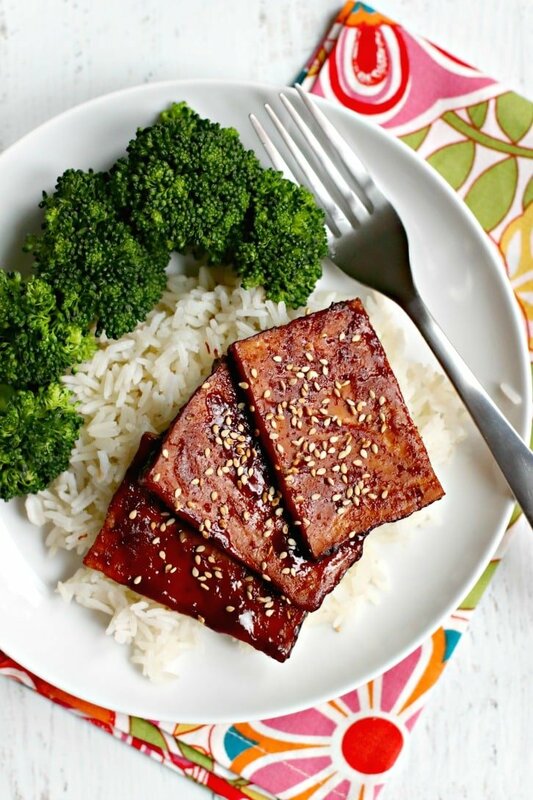 Baked Teriyaki Tofu is flavorful and easy to make in about an hour. Enjoy it with rice and vegetables or your favorite side dishes. It’s vegan, gluten-free, and oil-free. Do you love teriyaki sauce? I sure do! One of my favorite things to do with it is use it as a marinade and sauce for tofu. And if you think tofu is bland and boring, you’ll change your mind when you try Baked Teriyaki Tofu. Baked Teriyaki Tofu takes very little effort to make. You can make the sauce ahead of time and store it in the refrigerator for a few days until you’re ready to use it. But if you wait to make the sauce at the same time, it will only take you an extra 15 minutes, so there’s no need to plan ahead. And most of the time the tofu is either marinating or baking in the oven, so it’s a very hands-off recipe. 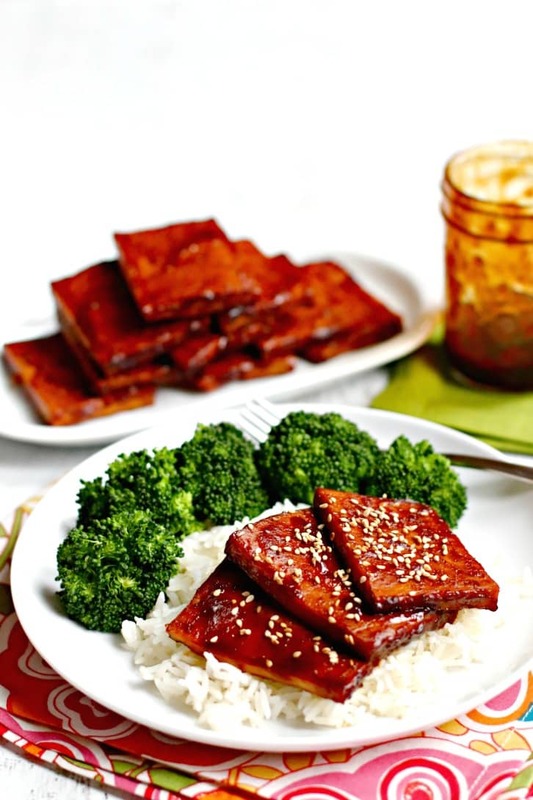 You can spend this time preparing some simple side dishes to go with the tofu. It’s delicious served over a grain like rice or quinoa with some steamed vegetables on the side. Or you could enjoy it on a bed of fresh baby spinach. 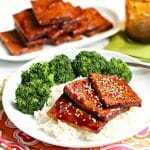 To make Baked Teriyaki Tofu, you simply marinate the tofu in the sauce, then bake it in the oven. First I press extra-firm tofu to remove the excess water. However, if I can find super-firm tofu, I use that instead since no pressing is needed. Then I cut the block of tofu into 12 slices. To make for easier clean up, I line the baking dish with aluminium foil. You can use either a glass baking dish or a metal baking sheet. Another tip is to use a silicone brush to spread on the sauce. When you’re done, you just rinse it and put it in the dishwasher. I spread the teriyaki sauce on one side of each slice of tofu, then flip them over in the baking dish and coat the other side. Then I let the tofu marinate for 30 minutes to make it extra flavorful. Next the tofu goes in the oven for 30 minutes. Finally I flip over each piece and brush on a little more sauce. Then after 5 minutes I remove the tofu from the oven, and its ready to serve. If you like, you can garnish the tofu with some toasted sesame seeds. Now let’s make Baked Teriyaki Tofu! Baked Teriyaki Tofu is flavorful and easy to make in about an hour. Enjoy it with rice and vegetables or your favorite side dishes. It's vegan, gluten-free, and oil-free. Slice the block of tofu into 12 slices. Place the slices in a baking dish lined with aluminum foil. 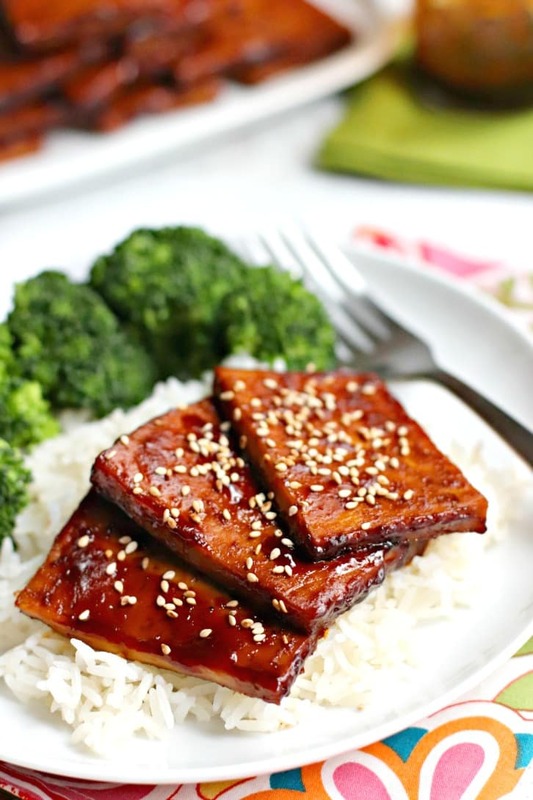 Brush each slice of tofu with teriyaki sauce. Flip each slice over and brush the other side with teriyaki sauce. Allow the tofu to marinate for 30 minutes. Bake the tofu in a 400 degree F oven for 30 minutes. After 30 minutes, remove the baking dish from the oven. Carefully flip each slice over and brush on a little more sauce. Return the baking dish to the oven and bake the tofu for an additional 5 minutes. Garnish with toasted sesame seeds, if desired, and serve. I always buy the pre-marinated and baked teriyaki tofu at the store which is CRAZY expensive. Never again. This is even better. I buy the super firm tofu that’s pre-pressed so very minimal work to put this together. Then I throw it in the fridge because I’m weird and like it cold.